each has full margins and tied to a legal letter from Liverpool to Manchester which would have contained a mortgage deed hence the 6d rate. 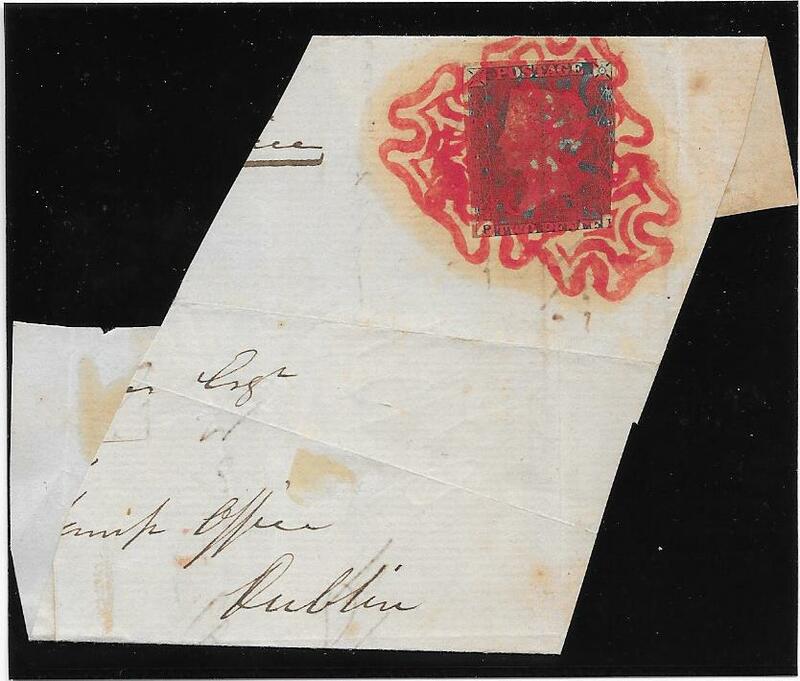 Letter dated MAY 21st 1840 and on the reverse top flap is a very fine Liverpool cds for MAY 22nd 1840 in the same orange shade as the Liverpool crosses. Gibbons lists the 1d black used with the Liverpool orange cross, Spec A1vg, but NOT the 2d blue. This item is recorded in Jackson’s Book of May 1840 dates where it is described as a ‘divided strip of three’. As seen in the images the stamps have been partially divided in a vertical direction but not separated. Such a method was used in the post offices at the time by the postal clerks to speed up the separation when the stamps were needed. Jackson mentions ‘creasing/wrinkling’ but there is NO evidence of creasing and the only wrinkling is perhaps in the NE square of ‘HL’ and is very minor. 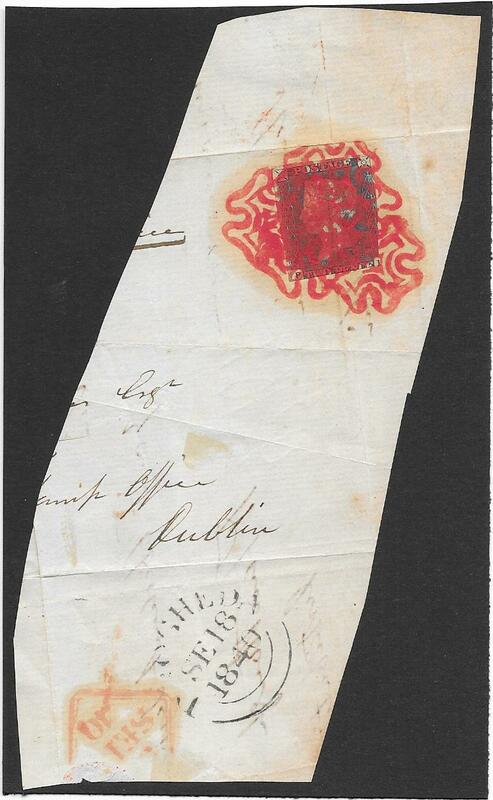 It would appear that the creasing/wrinkling refers to the inside of the letter as seen in the scan. 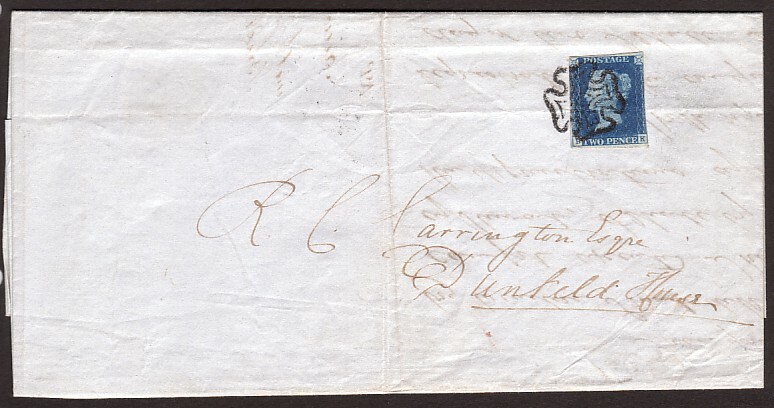 He records ONLY SEVENTY examples of the 2d blue used in MAY 1840 on covers and pieces including combinations on Mulreadies. 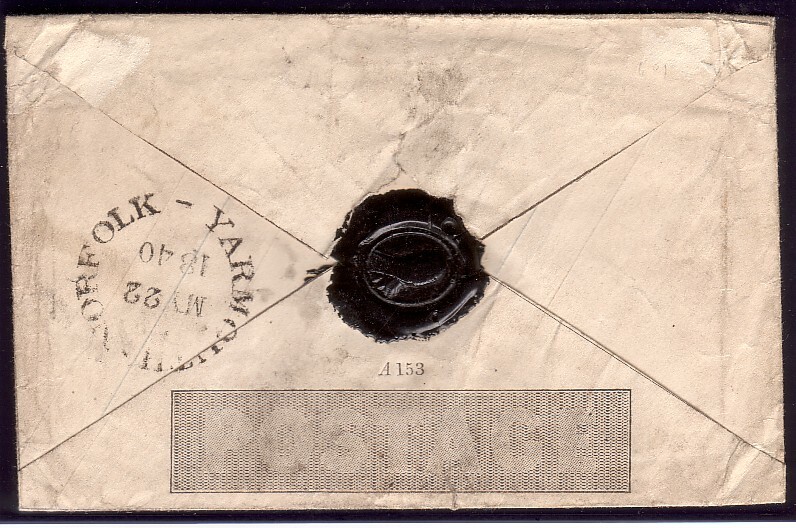 This compares with EIGHTY SIX examples of the 1d black used on the First Day of Issue, May 6th 1840! 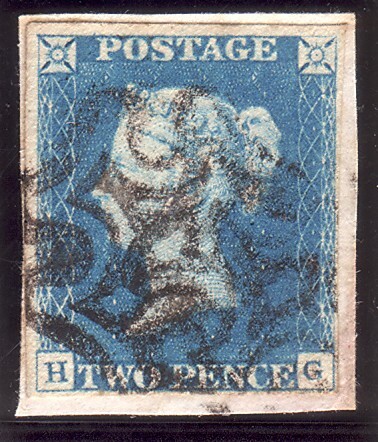 Of the SEVENTY 2d blue May 1840 items: TWENTY FOUR examples have faults to the stamp(s) and/or are not 4-margined: each of ‘HJ-HL’ has full margins. Only one other 6d rate is recorded between May 6th and May 21st and with that example the 2d blues are touched and or torn/damaged. this would rise to an estimated Gibbons price in excess of £30,000 if included. A superb and extremely rare item and one of Exhibition importance. tied to a small piece by lightly applied red/orange crosses. Priced by Gibbons in the latest, 2011, Edition of QV Volume 1, from £2,000. in the Deep Blue shade, SG Spec DS7. of the distinctive LEEDS Cross, SG Spec SS7vd. Priced by Gibbons in the latest, 2011 Edition, of QV Volume 1 at £3,000. 151556. 2d blue Plate 1: deep blue shade. 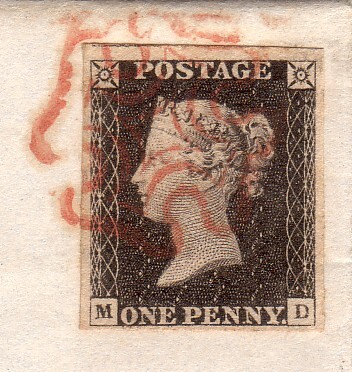 A fine 3 plus margined example with a complete black cross. Priced by Gibbons at £1,100. 151547. 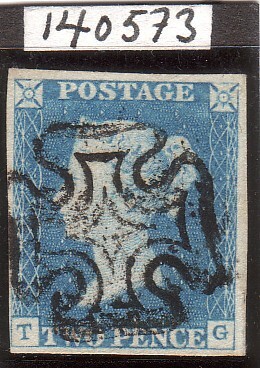 2d 'EK' Plate 1: fine 4-margined example, some blue marks on the reverse. Printed in the scarce Deep Full Blue shade and with the variety 'Double Letter K', Spec DS1j. 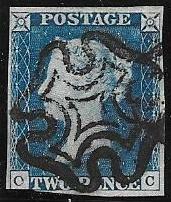 the stamp is cancelled by the '918' numeral of WORCESTER. but allowing for the scarcer shade and letter variety this increases to well in excess of £3,000. 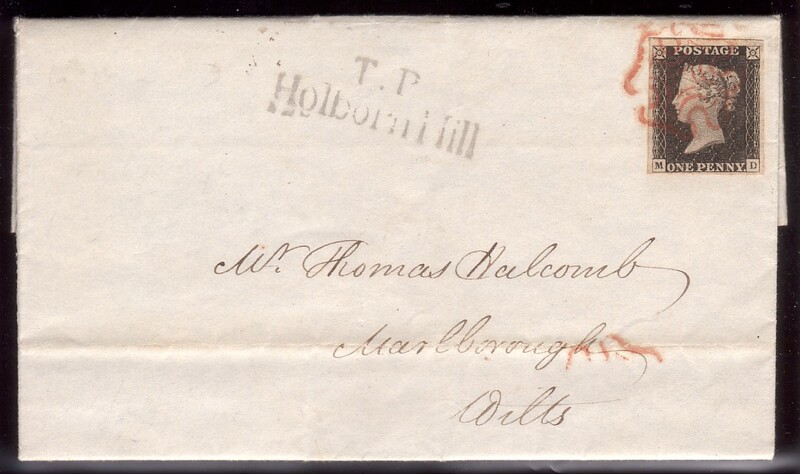 An attractive and very scarce/rare stamp in fine condition with an 1844 cancellation. 2d Blue Plate 2 Deep Full Blue. a superb example with good to huge margins and partial double black crosses. 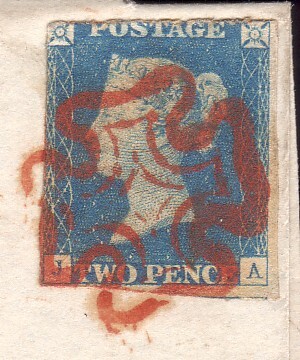 Margin at left with large portion of stamp ‘DE’ which has the listed variety ‘double letter ‘E’ ‘. 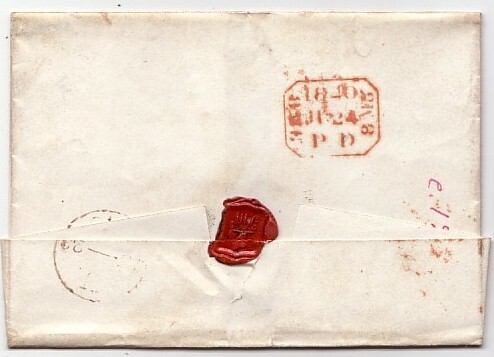 Printed on unlisted thin paper and showing plate corrosion in and around ’POSTAGE’. An exceptional stamp and priced by Gibbons at a minimum of £1,300. GREENOCK distinctive cross with RPS Cert. GREENOCK cross, SG Spec D1va, and offered with a clear RPS Certificate. 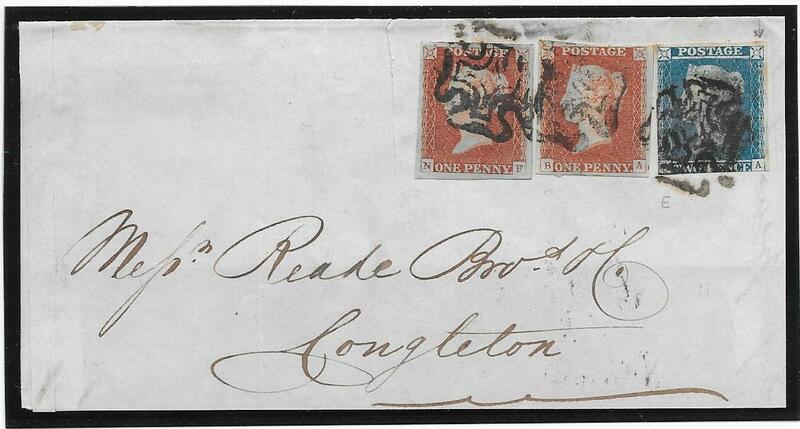 A rare stamp and priced by Gibbons in the latest, 2011, Edition of QV Volume 1 at £2,500. Sample of Engine Turning: similar to that used on the 2d Blue. had patented a machine - the Rose Lathe, a type of geometrical design lathe. This was used for engine turning on the back of watches. in the 'POSTAGE' design part of he Mulready as a protection against forgeries. This was agreed by Rowland Hill and Henry Cole. The example offered here is an engine turned sample, circa 1838/9, no. 5D (ex Plate 'D'). 2d blue or Mulready Collection as well as a general Line Engraved Collection. The first such sample we have been able to offer. and tied by FIVE bright vivid red MX's of DROGHEDA. on a 1d black cover, September 8th 1840. We have never seen FIVE MX's used on any value and therefore this item is believed to be UNIQUE. but philatelically speaking, very pleased they did! A truly remarkable line engraved rarity and a memorable Exhibition Piece. NB: the apparent yellow/browning around the MX's is far fainter than the scan suggests. 'double letter 'F' illustrated in the latest, 2011, Edition of QV Volume 1, page 160.
for SEPTEMBER 24th 1840 on the reverse top flap which displays well when raised. began on August 31st/September 1st 1840. The 2d blue on cover in the scarcer deep full blue is priced by Gibbons in excess of £3.000. A superb and extremely rare item. 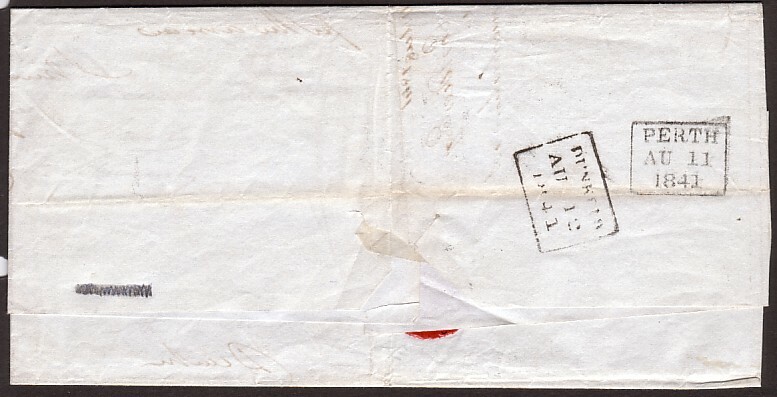 1841 Provisional Repair. Black MX’s and handstruck ‘TOO LATE’ in red – possibly applied in London. 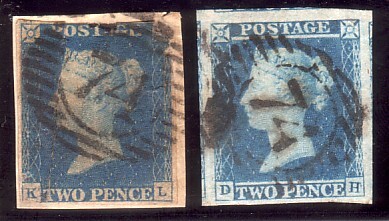 A multiple of Plate 5 showing a Repaired State is rarely found especially used in combination with an 1840 2d blue. ‘NF’ and ‘BA’, both full margined and both from Plate 24 with black MX’s on front and part back. 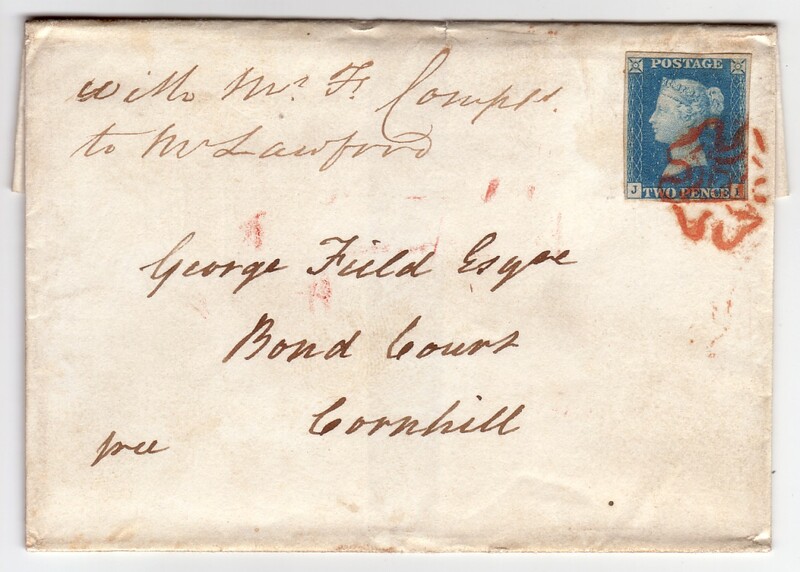 On the reverse top flap is a part Congleton cds for 1843.
the different plates used from both the 1d red and 2d blue issues to make up the 4d rate. 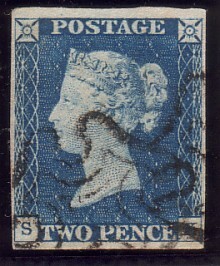 2d DEEP BLUE Plate 2.
strikes of the MX leaves QV with a clear profile allowing the deep blue to be seen to advantage. Spec DS7 and priced by Gibbons at £1,300. 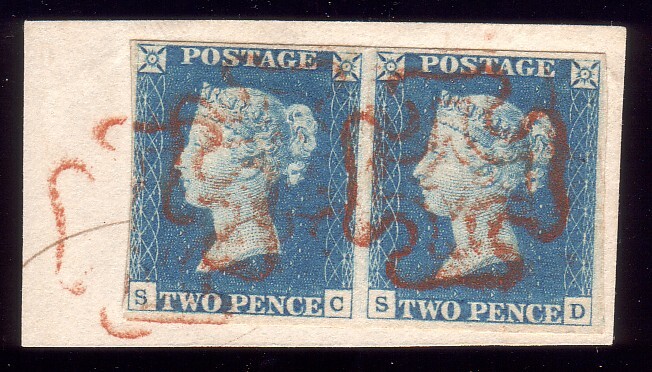 Late usage of 1840 2d Blue Plate 2 with Rare Cancellation and paired with 2d Plate 4.
type74D4A of the London District Post Chief Office. 'Barred Numeral Cancellations of London'. 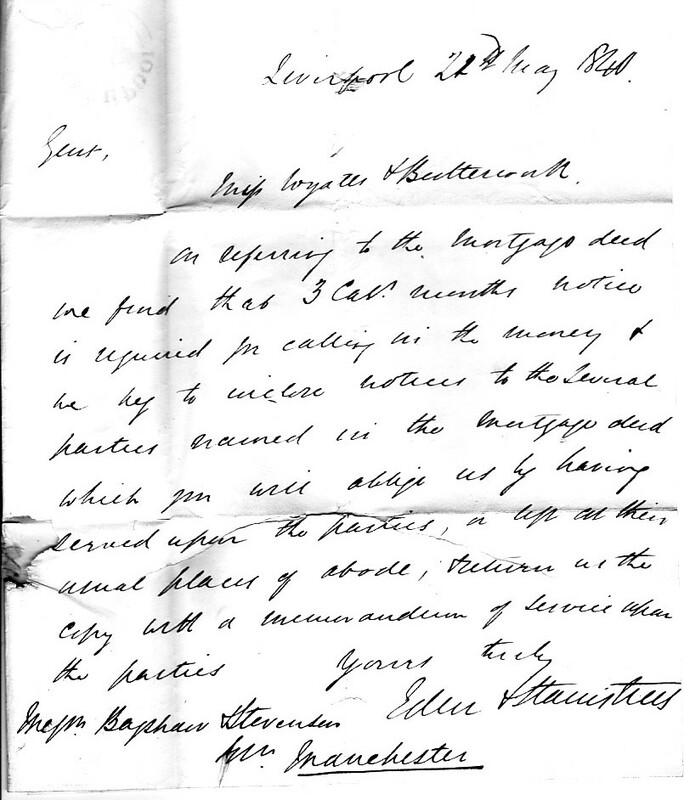 The cancellation is recorded in use from June 1852-March 1853. The 2d Plate 2 is tied to a small piece and has a NE corner fault with a light surface scatch above the 'T' of 'TWO'. However, it is a very late usage of this plate and possibly unique with this very rare cancellation. 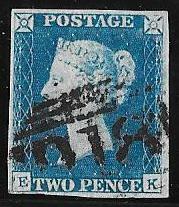 The Plate 4 is a superb example, huge margins with parts of three other stamps. Printed in a Deep Full Blue on the catalogued thin paper variety, Spec ES15q and shows a fine Ivory Head. 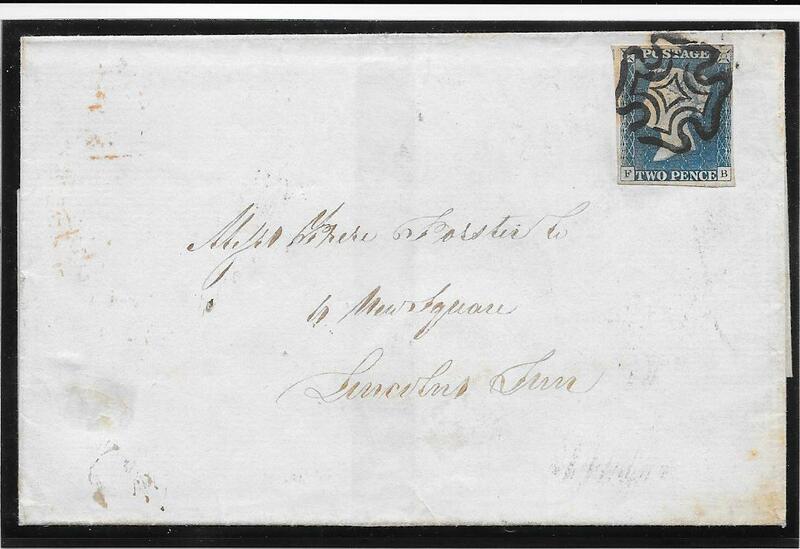 Plate 2 with an 1844 numeral cancellation is priced by Gibbons at £2,500. DUBLIN Cross: constant break variety. 15195. 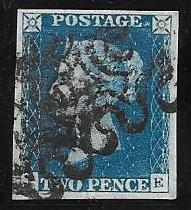 2d deep blue Plate 2, ‘RD’: large margins but just clear to shaved NW corner. a very fine/superb strike of the characteristic DUBLIN CROSS, Spec DS7vj. only 3 out of 41 covers showing this variety all on 1d reds. 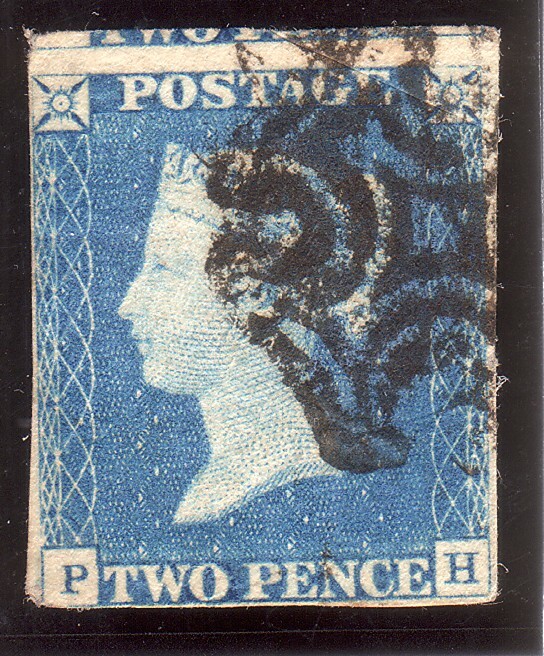 is the only one known on the 1840 2d blue and is a late usage within the MX period. by Gibbons in the latest, 2011, Edition of QV Volume 1, at £2,500. by two superb strikes of the DUBLIN characteristic cross to a piece. showing this variety and all on 1d reds. 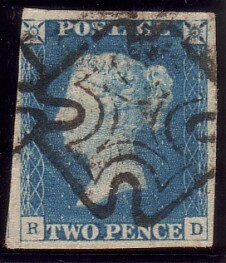 here of this variety are the only known strikes on the 1841 2d blue. by Gibbons in the latest, 2011, QV Volume, at £700, Spec ES11ul. 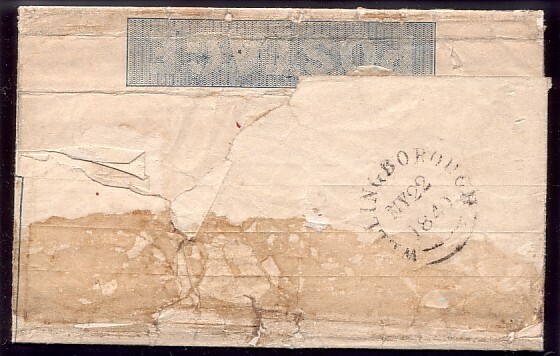 with a large part of the adjacent stamp at the right. Cancelled by a lightly struck red cross, and part of a second, leaving a clear profile. Clean back: an attractive stamp with this combination of colours. Priced by Gibbons at £900. NB: There is a very small ink mark at the right above the 'B' square. on the back of another letter when placed in a pile. 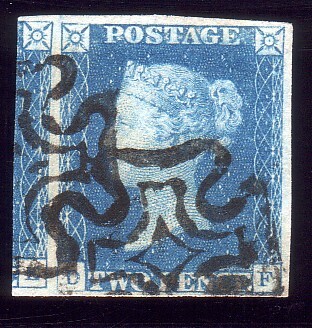 2d Blue Plate 1: exceptional example on cover. the scan suggests – and used within London. The orange-red cross leaves most of the Queen’s head clear. 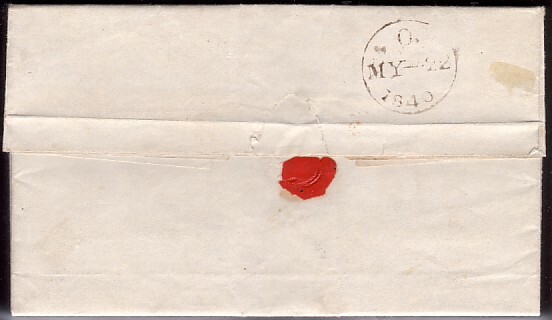 On the reverse is a London date stamp for June 24th 1840 in the same shade of ink as the Maltese cross. Plate 1 on cover with a red cross priced by Gibbons at £3,000. 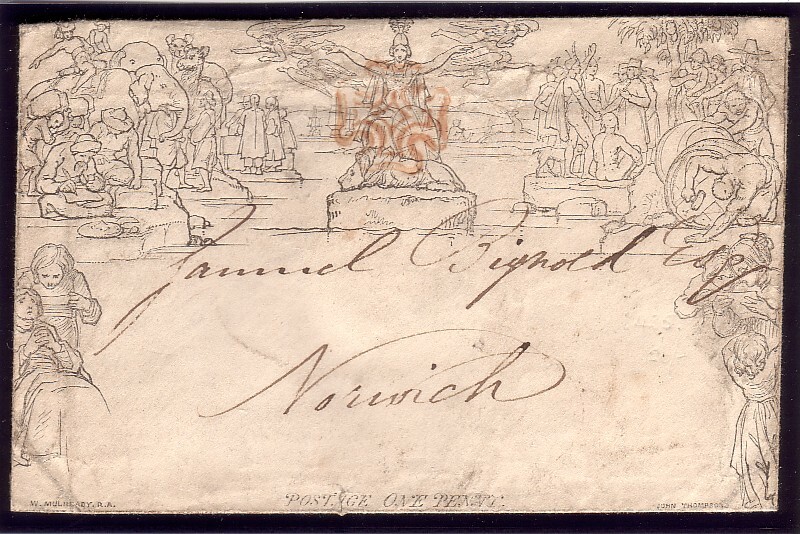 A superb item and one of the most attractive 2d blue covers we have offered. 2d Plate 1: cross similar to DUMFRIES. complete small black cross reminiscent of that of Dumfries. Shade close to, or at, deep blue. 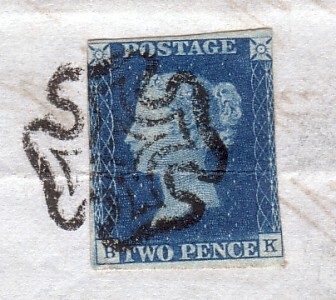 15142: 2d blue plate 1, pair ‘KJ-KK’, printed in the rare STEEL BLUE shade, SG Spec DS4. Full margins, large to close but clear, and placed across a light fold in the paper prior to posting. by THREE strikes of the characteristic GREENOCK CROSS, Spec D1va. 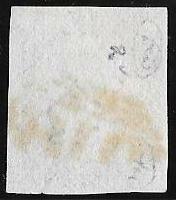 and an estimated catalogue value (ECV) single of this rare shade is £17,000 with this cross on cover. 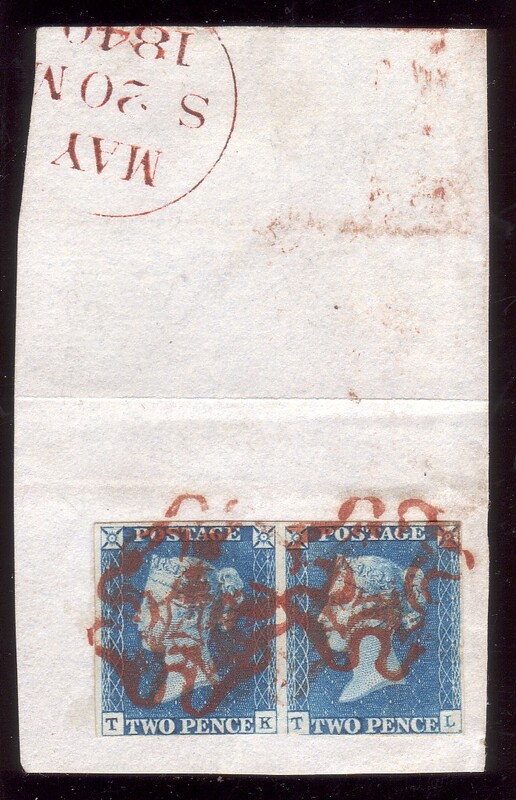 A pair in this shade on cover with this cross has an ECV in excess of £30,000. record only two earlier usages of the characteristic Greenock cross and these are on 1d black covers. especially visible on the right hand bottom cross going onto the letter and possibly caused by a holding pin in the cross. This constant variety was NOT recorded by Rockoff and Jackson. A superb line engraved rarity. NB: the scan does not do justice to the steel blue shade. 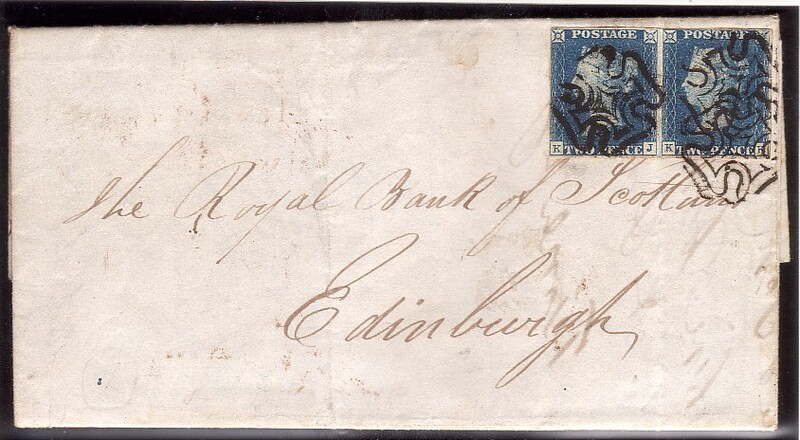 wrapper, Perth to Dunkeld August 11th 1841, by a fine PERTH characteristic cross. and priced by Gibbons at £9,000 on cover in the latest, 2011, Edition of QV Volume 1. 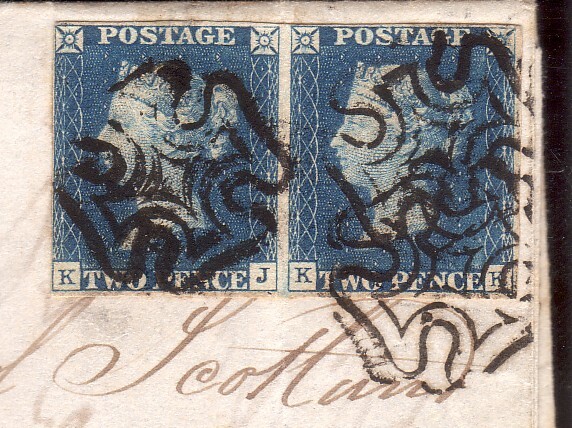 Rockoff and Jackson has NO recorded example of this Perth cross on an 1840 2d blue. A very rare and attractive item. tied by a double strike in red of the characteristic Worcester cross to an entire to Stourbridge. 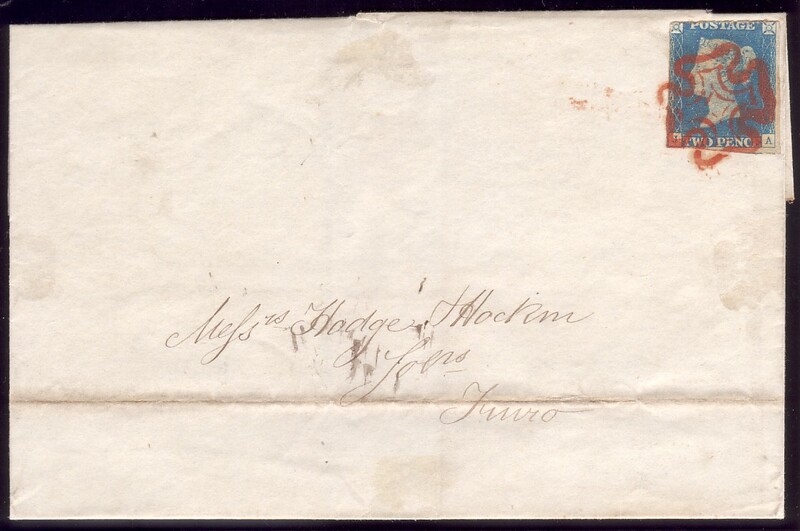 Letter dated May 18 1840 and on reverse is a partially struck Worcester date stamp for this same date. 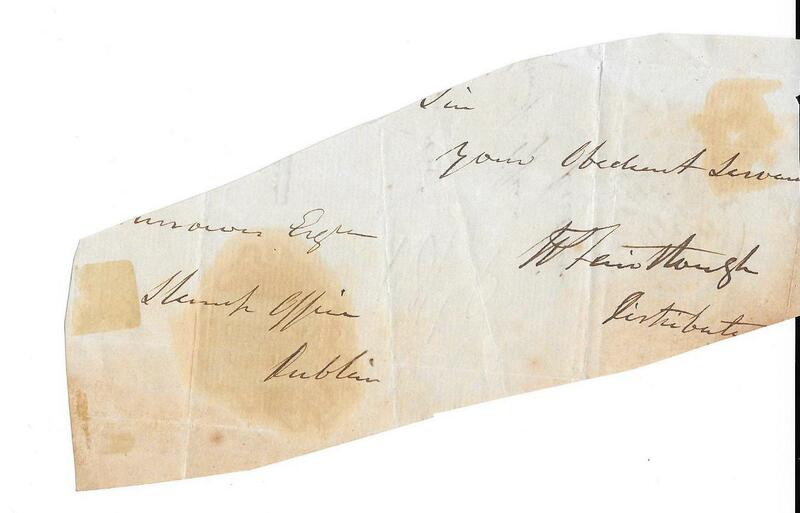 This rare May 1840 letter is recorded in ‘May Dates’ by Jackson. at May 18 1840 is the earliest recorded usage. Offered with a 1d black plate 1a on matching dated piece for May 18 1840. 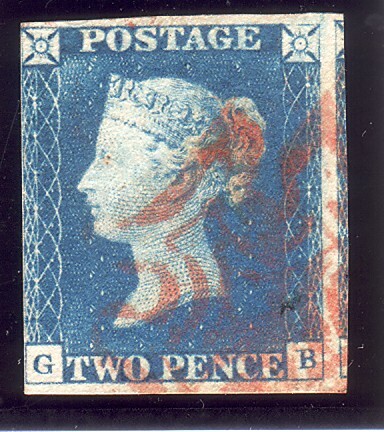 This May 1840 date for the 2d blue is priced by Gibbons in the latest, 2011, Edition of QV Volume 1, at £17,500. A UNIQUE Quartet of Items: May 22nd 1840. 2. 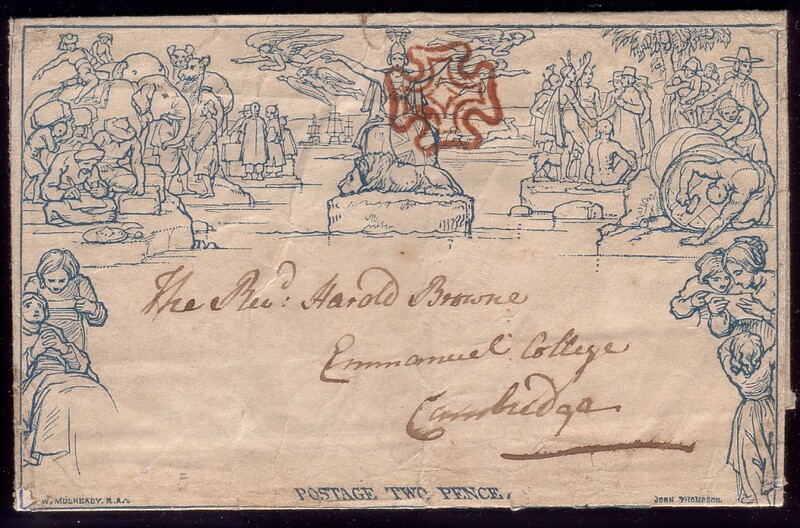 2d Mulready wrapper, from Wellingborough to the Rev Harold Browne, Emmanuel College,Cambridge together with his biopic. Superb deep orange cross, very fine address panel, faults on the reverse but with a clear Wellingborough date stamp. which includes both letter sheet and envelopes. 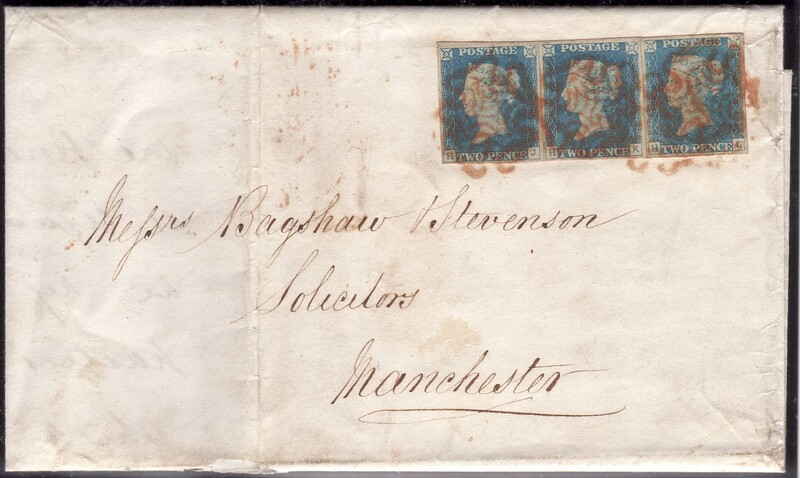 The rarity of these is emphasised by Jackson recording 86 1d black covers used on the First Day of Issue, May 6th 1840! fine red/orange cross. 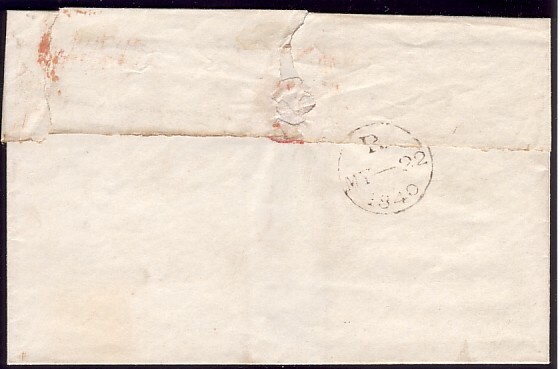 London date stamp on reverse top flap: unrecorded by Jackson Code ‘O’ for evening duty. Appears to be the broken points London cross, unrecorded on the 2d blue. London date stamp, Code ’R’, (evening duty), on reverse. which includes pieces as well as full covers, but 86 1d black First Day of Issue examples. A truly remarkable and unique grouping. NB: each item is in much better condition than the scan suggests. 15008. 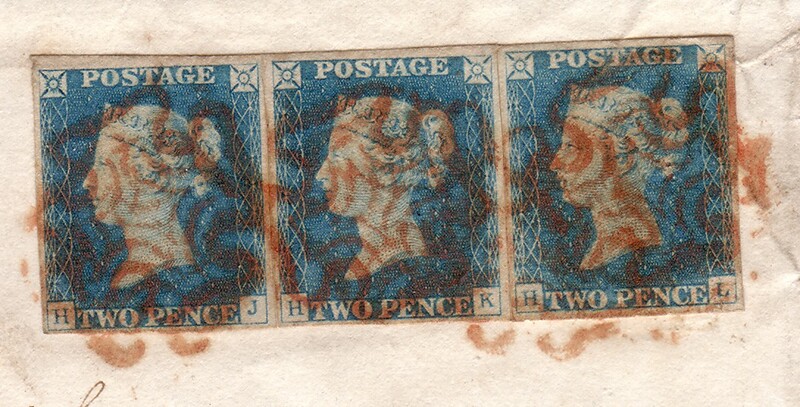 2d plate 1,‘TK-TL’, on dated piece with an almost full-margined pair in a rich blue and well tied by MXs in an unusual deep orange-red. 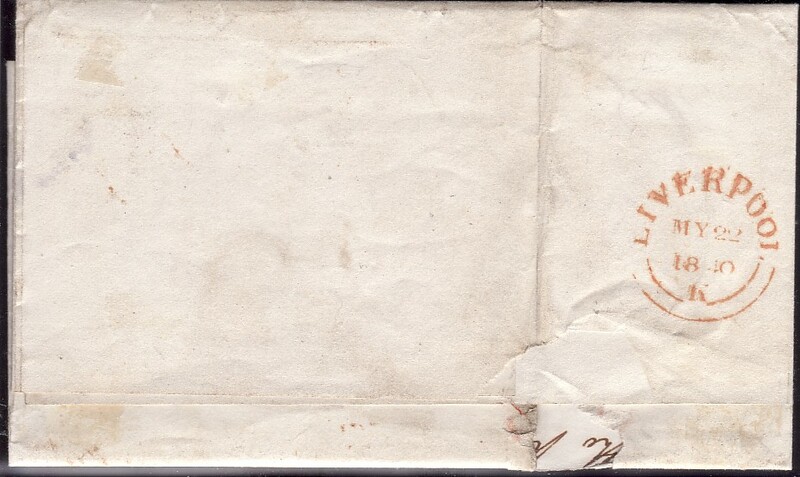 Edinburgh date stamp for MAY 20th 1840. Stamp ‘TK’ clear/barely touching at ‘K’ square and ‘TL’ just into at the ‘T’ square. A pair with a red cross in the cheapest shade priced by Gibbons in 2011 in excess of £2100 on stamps alone. Stamp ‘TK’ has the listed variety guide line in the NW corner. 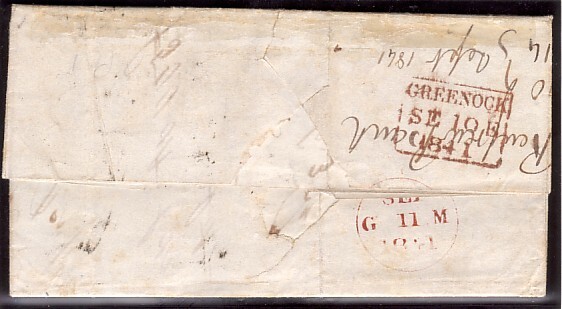 a single 2d on a May dated cover priced by Gibbons in the latest QV Volume 1, 2011 at £17,500. some minor wrinkles and a surface scratch top right. at £3,000 on this issue.